I see (and hear), I remember. I (see, hear and) do, I understand. Every pupil will be involved, every pupil will have 'made' and 'handled' by the end of the day. I will travel up to 40miles from Portsmouth! "Thank you so much for yesterday. We all had a great time. The children were buzzing when they went home. We hope you will come back next year." For Schools - Do it Yourself! 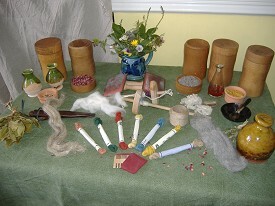 All you need for a "hands-on" day of rural life in Medieval and Tudor times. Apothecary - Pomander Bead making kit, plus "recipes" for other easy to make "medicines"
Food: - recipes for sweetmeats to make table decorations. Recipes for a complete meal with a course being made per session. Let everyone sit down and try it at the end of the day! Instructions, pictures, photos and information with each of the above. Split the school day into 4. Have 4 groups of pupils doing each activity in turn. In "Food" split again between sweetmeats and a course of the meal. In the 4th lesson of the day have everyone sit to a meal, on tables laid Tudor-style, and listen to Tudor Table Manners - Not Hollywood Henry! do a fourth activity e.g. candle dipping, illuminated lettering, or building model houses of the day. Hands On History - bring History Alive! "I just want to say thank you for sending the order for our Tudor Day and to let you know what a fabulous time the children and I had." 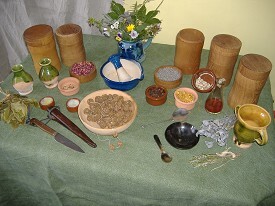 Carrying scented beads etc spans many centuries, from early medieval times to the 'vinaigrette' boxes of the Victorians. or The Great Fire of London 1666 where details of how the housing, its materials, streets and living conditions not only helped the spread of the fire but why pomander beads would have been carried by many. Samples of linen ranging from the finest worn by the wealth to a rough linen worn by the peasants. Samples of wool, again ranging from that worn by the richest to the poor, not just the quality but in colour for each class. Clean, raw wool for the whole class to 'finger-spin'. Sample of silk fabric, raw silk thread, and silk cocoons, one with worm rattling inside!
" We had our Tudor Day and it was really great. My kids loved it, even the nearly 12 year old got really into it." Kit sent to South Africa to a mature fashion design student! If you have an email address I can send an invoice via Paypal and you can pay by credit/debit card. 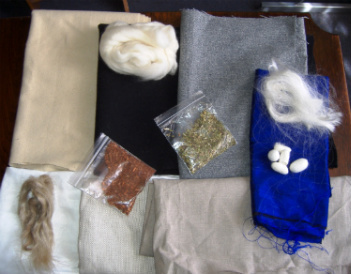 Fleece to Fabric Kit with samples of wool, linen and silk fabric, also raw wool, linen and silk, silk cocoons and madder root and goldenrod for dyeing. "Our day went brilliantly although it's totally exhausting being a Tudor for the day! The children loved it! They made an excellent effort with their costumes and we enjoyed making the Pomander Beads, painting stained glass windows, eating Pease Pottage at our Tudor Banquet, and having our Tudor Ball. The parents came in for the last half hour and we did a little show for them which they enjoyed. The Tudor Apothecary worked so well as you were so kind in supporting us. 'Tudor Recipes for the Modern Cook' has been published and is now on sale through this website or Amazon where there is a 'look inside' facility. This is being offered to schools with a CD of all my lessons covering food, farming, clothing, women & children, medicine and its practitioners, the physic garden, practical things to do, and how all this can relate to English & Geography lessons. A disk with 6 classroom lessons, practical lessons for schools with a range of facilities, and follow-ups including crossover lessons in English and Geography. 6. Women's Work - rich and poor,including brewing, dairying, music, overseeing the estate when the men were at war. All lessons have visuals of photos, pictures and diagrams. Enjoy planting sweet-scented herbs and watch them grow. Learn their magical, medicinal qualities. See the wildlife a Physic Garden attracts. Plans, plants and 'hands-on' activities from them. 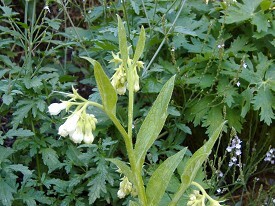 Comfrey - known as knitbone - surrounded by the magical fairy flowers of vervain.